Looking for a delicious breakfast you can make in advance? Check out these low FODMAP sweet crêpes. These paper-thin pancakes, brushed with chocolate ganache and stuffed with fresh strawberries are a mouthwatering way to start your day. Traditionally, sweet crêpes are served for dessert. But, since they’re essentially skinny pancakes stuffed with fresh fruit, I think they’re really a breakfast in disguise. Even if they are technically a dessert, I won’t tell if you don’t. These sweet crêpes are perfect on lazy mornings since you can make the batter the day before and refrigerate it overnight. Just remember to let the batter warm up on the counter for 30 minutes before you use it. If you fall in love with these crêpes, but you’re normally short on time, you can also make them in batches and freeze them for later. To freeze them, portion your crêpes out so you can defrost one batch at a time. Then, wrap each batch in tinfoil and then seal each batch in a freezer safe Ziploc bag. These take 12 hours to defrost, so make sure you take them out the day before you need them. 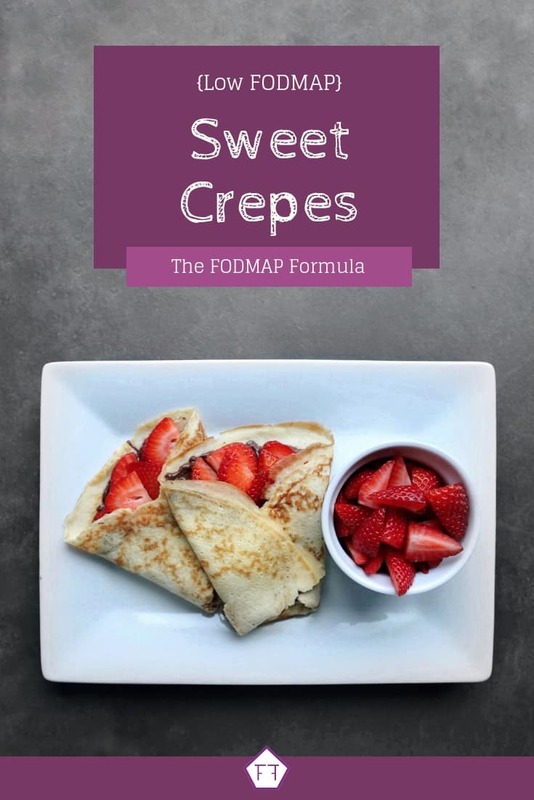 Think these low FODMAP sweet crêpes sound great, but you don’t have time to try them now? Don’t worry! You can PIN THIS POST for later. These low FODMAP sweet crêpes will make you fall back in love with breakfast. Check out the notes below for tips on keeping this recipe FODMAP Friendly. First up is flour. If you’re in the elimination phase, you’ll need to use a gluten-free flour. I’m a huge fan of PC’s all-purpose gluten-free flour. I like it because I can use it cup for cup and it doesn’t have any gums. You’ll also need to use a lactose-free milk. The fat content of the milk doesn’t matter for this recipe, so use whatever you have on hand. Most milk alternatives don’t agree with me, so I haven’t experimented with nut-based milk. If you try it with a dairy alternative, let me know how it turned out in the comments below. This recipe also uses butter. Even though butter is technically a dairy product, according to Monash university it doesn’t have any FODMAPs (because it’s all fat). This means you won’t need to use a lactose-free butter to keep this recipe low FODMAP. Chocolate chips on the other hand normally have lactose, along with wheat and high FODMAP sweeteners. I normally use Enjoy Life vegan chocolate chips. They’re wheat, nut, and dairy free and they melt really well, which is perfect for this recipe. To turn our chocolate chips from a melted mess into ganache, we use 2 tbsp of coconut oil. Since oils are low FODMAP, this won’t add any extra FODMAPs to your crêpes. Our final ingredient is fresh strawberries. In case you didn’t know, strawberries are one of a few fruits that don’t have any FODMAPs, so feel free to use as many strawberries as you want. 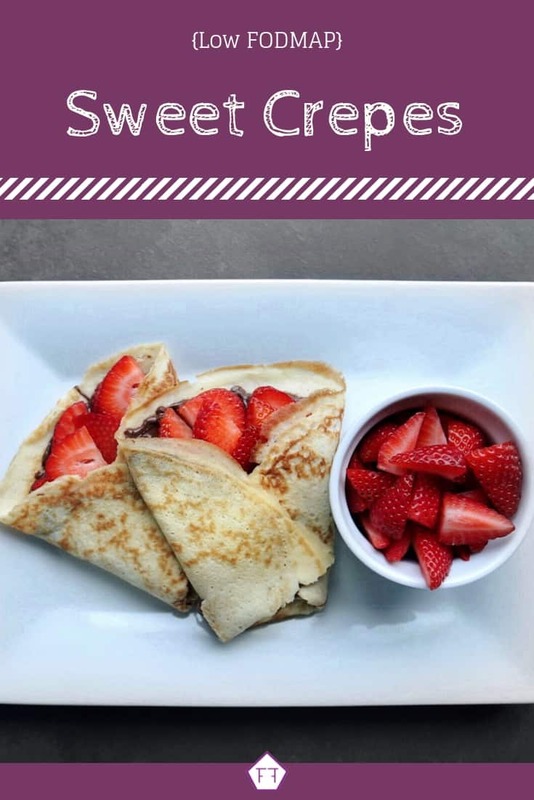 These low FODMAP sweet crêpes are a great way to start off your morning. If you’re looking for a sidekick for your breakfast, I highly recommend this low FODMAP stovetop granola. If you’re looking for a coffee replacement to take this breakfast from awesome to epic, you can also try this low FODMAP London fog or my quick and easy FODMAP Friendly hot chocolate. Want to try these low FODMAP crêpes? Don’t forget to PIN THIS RECIPE for later! Looking for a sweet breakfast idea? Try these low FODMAP sweet crêpes. 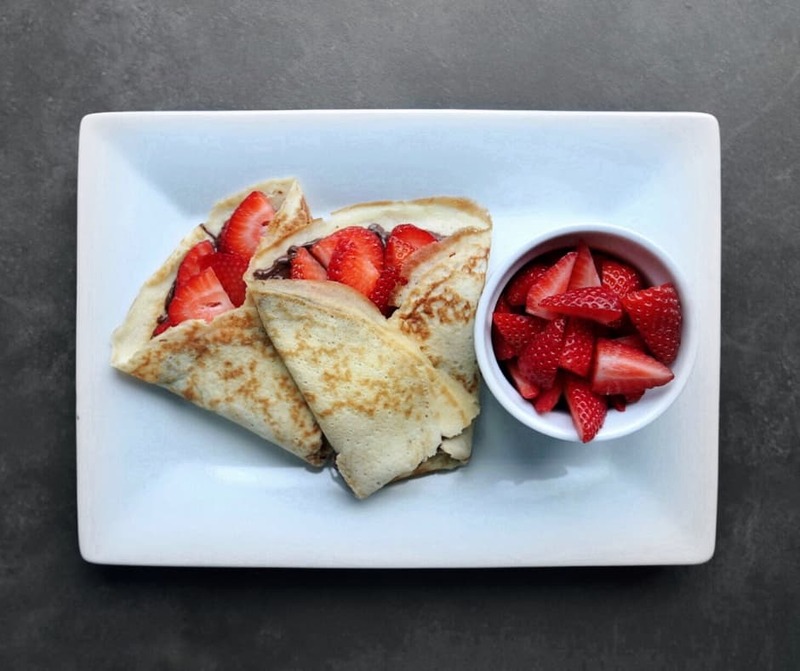 Covered with chocolate and fresh strawberries, these crêpes are a mouthwatering way to start your day. Warm a crepe pan or a small non-stick frying pan over medium heat. Add one tsp of butter and swish it around to cover the bottom of the pan. Lift the pan off of the burner and tilt the pan at a 90-degree angle. Add your batter toward the top of the pan so gravity will pull it downward. Then, level the pan and swish the batter back and forth to cover the bottom of the pan. Place the pan back on the burner and cook the crepe for 1-1.5 minutes (until it's a nice golden brown on the bottom). Then lift the edge of the crêpe with a knife and either lift it with a spatula or your fingers to flip it over. Cook on the other side until it's lightly browned. Then, slide it onto a plate covered in wax paper. Melt your chocolate chips in a double boiler (a heatproof bowl sitting on top of an inch or so of steaming water). Stir in the coconut oil and spread a thin layer over each crêpe. 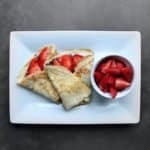 Place a small number of strawberry slices in the center of the crepe and fold it in thirds. If this is your first time making crepes, I suggest making double the recipe as it can take a few practice crepes to get the hang of things. The batter for this recipe can be made up to two days in advance. Just make sure you let the batter sit at room temperature for at least 30 minutes and give it a stir before you use it. Once you've made your crepes, you can refrigerate them in an airtight container for up to 24 hours or wrap them in foil in tinfoil and seal them in a Ziploc bag for up to a month in the freezer. These low FODMAP sweet crêpes are a mouthwatering way to start your day. If you like this recipe, sign up for my mailing list below. You’ll get new low FODMAP recipes and articles delivered right to your inbox.